Chris Jones of Micro-Epsilon explains the factors required for the specification of draw wire position sensors. Depending on the industry and application, draw wire position sensors are commonly referred to as cable transducers, cable-extension transducers, string potentiometers, draw wire transducers, yo yo pots, linear position string pots, and string encoders. However, in this article we shall refer to these sensors as draw wire position sensors. The draw-wire measurement principle is a contact measuring technique. Draw wire position sensors are a simple yet robust method of measuring displacement, position and movement. The principle of a draw wire sensor is relatively straightforward, hence its inherent reliability. The sensor works rather like a tape measure, except with a draw-wire sensor the user does not have to read off the measurement of the extended tape. The rotation of the drum on which the steel wire is wound is measured automatically and the measurement signal is output in either analogue or digital formats. A draw-wire sensor fundamentally consists of wire, a drum and a spring-driven motor (referred to as the ‘mechanics’) and a potentiometer or encoder for the measurement of signal generation. Draw-wire sensors are used when large measuring ranges are required using a low cost compact sensor. Typically, the wire is made from thin braided steel (for flexibility yet high tensile strength) and polyamide-coated to give environmental protection. On average, the wire is approximately 0.8mm thick, depending on the measuring range. 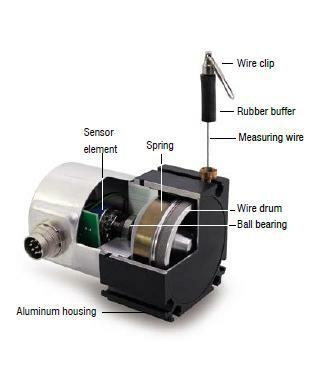 Using a draw-wire sensor, a linear movement is transformed into a rotary movement. The free end of the wire is fixed to the moving object. At the open end of the wire is an eye or threaded shaft (user selectable) used for fixing to the measurement object. An encoder subsequently translates the rotary movement created by the extension of the wire into an electronic signal. A spring-driven motor provides sufficient wire pre-tension. This is a coiled spring with torque load similar to clockwork mechanics. The more the wire is pulled out, the higher the tension force of the spring. This has the advantage of reducing wire sag in horizontal set ups. Applications for draw wire position sensors are widespread across many different industries. The most common applications include hydraulic cylinder position measurement; lifting platforms/scissor lifts; off-highway vehicles; automotive and aerospace testing; factory automation; medical devices such as surgical arms and operating tables; structural monitoring of buildings, platforms and plant; industrial machinery and automation; laboratory and test rigs. Typical measuring ranges for draw wire sensors are from 50mm up to 50,000mm (50 metres), but this varies depending on the sensor supplier. Size, compactness and weight could all be important factors to consider, particularly if the sensors need to be mounted in difficult-to-access positions. The size of the sensor housing relative to the measuring range may also be a critical factor, especially if the size of the housing needs to be relatively small for a large measuring range. For example, the most compact model in the Micro-Epsilon draw wire sensor range is just 30mm in size but offers a measuring range of 750mm. Some suppliers can provide miniature sensors with swivel flanges for easy mounting and installation. The capability of a supplier to provide customised sensor designs to suit high volume OEM applications may also be critical to your project. In this case, look for a supplier that can offer many modified sensor variants, as well as the ability to develop completely new sensor specifications if required. Some suppliers offer different housing materials such as aluminium or low cost plastic versions for high volume applications. It’s also worth checking how quickly the supplier can offer OEM modified sensor designs and how much stock they hold at a local level that can be easily modified. The ability of a supplier to combine different sensor elements and measuring ranges with different enclosure options will mean that an ideal draw-wire sensor can be provided for virtually any OEM application. What electrical output options are required for the sensors? In principle, all commercially available and suitably sized rotary position sensors can be used as sensor elements in a draw wire sensor. This enables a wide variety of different output signals, from analogue signals (e.g. potentiometric, 4 … 20 mA, 0 … 10 V) to incremental signals (such as TTL, HTL, SSI) and digital fieldbuses (CANopen, CANBUS, Profibus, etc.). Nearly all common interfaces can be achieved. Most sensor suppliers can offer potentiometer, voltage, current, incremental and absolute encoder. Draw wire sensors tend to be very robust, particularly if the manufacturer uses only high precision components in its design. If this is the case, the sensors will benefit from a longer than average service life. Since the sensor components such as the potentiometer and wire are subject to wear, their lifetime is limited and will depend strongly on the quality of potentiometer or encoder used. Environmental protection levels for draw wire sensors vary from supplier to supplier. Typically, protection ratings are from IP54 up to IP68, making some sensors suitable for extreme industrial environments. If the sensor is mounted in a high voltage environment or is sensitive to interference from conductive materials, it will need to be adequately protected. Some suppliers can offer a plastic line rather than a steel wire, as well as plastic cable connectors. Draw wire sensors for medical applications typically use multi-filament spiral wire or hybrid potentiometers. These provide the necessary performance for many applications at an affordable price. The difference between the two types is in their respective service life. While draw-wire sensors with wire potentiometers are limited to approx. 200,000 cycles, up to 1 million cycles can be achieved using hybrid potentiometers. Encoder-based sensor elements can be relied upon when higher demands are placed on service life and/or accuracy, as is the case with CT scanner tables. Here, a linearity of up to +/- 0.01% of the measurement range and a considerably longer service life will need to be achieved. In addition, the displacement sensors will need to be controlled via digital interfaces, which are increasingly finding their way into medical technologies. For many years, Micro-Epsilon has been using injection-moulded plastic enclosures in medical technology, in contrast to the metal housings that are otherwise standard in industrial applications. This guarantees not only the smallest possible size, but also low costs with large volumes. This means that full use can be made of the inherent economies of scale that these sensors already offer.